Qualifying took place in the hot sunshine of Friday afternoon, resulting in Gareth taking pole position, with nearly a 20 second gap to the 2nd car, Michael Birch in JJ93. BGH21 qualified in 7th, AYL2 was in 22nd place, GO54 in 31st, GO53 in 40th and Luc in PL2 in 58th. But back in the pits there was some disconcerting news. 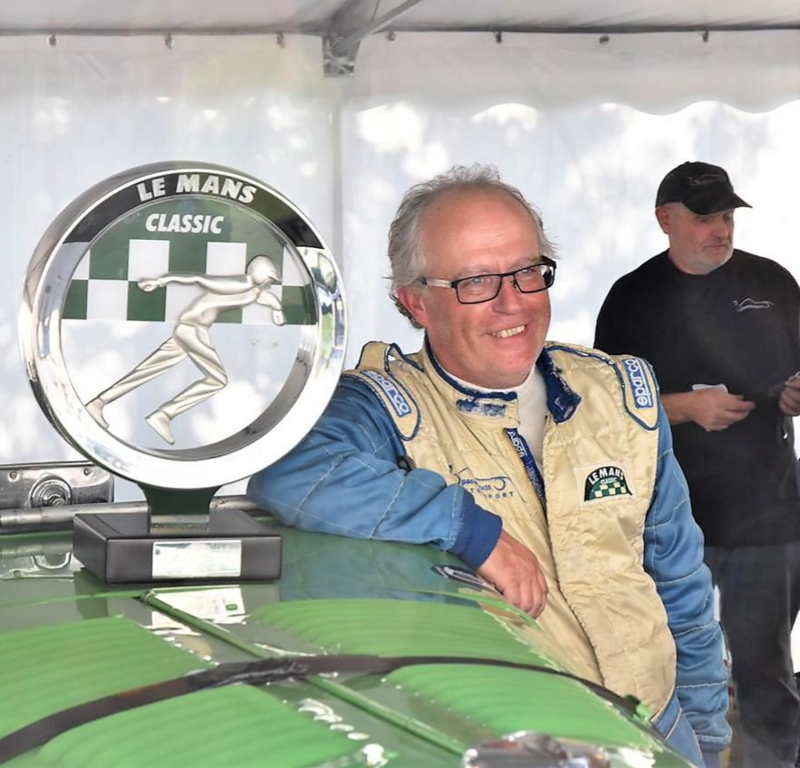 Nick Pellett had pulled off when GO54 lost oil pressure on the Mulsanne Straight – not the place to destroy a good engine! And Chris Lunn had a serious oil leak from the front of his gearbox. The tech crews worked hard all night to resolve Chris’ problem, but GO53 played no further part. And sadly, the same was the case for GO54. Gareth’s reflections on the qualifying session:‘LMC only comes around every other year, so for us it is the main event to showcase the capabilities of the Talbots to the historic racing world. And this year would be more important than ever as that Blue Lago-Talbot was again out to prove itself unbeatable. So, into qualifying we would find out the reality… Well, even I was surprised at the power of GO 52 as we headed down to Indianapolis the fastest part of the course, watching the rev counter climb - 4,800, 4,900, 5,000, 5,100 – 5,200rpm and a lap of 5-50 which seemed easy! We worked out the speed and it was 138mph without help of slipstream. Imagine what it would have been if car was more streamlined! Race day was a scorcher! Following the mock ‘Le Mans start’ and formation lap, it was a memorable and dramatic moment to watch the two leading Talbots come belting round the bend at the end of the start straight as they headed to the chicane and the Dunlop Bridge. There were a couple of BMW 328’s and a noisy Bugatti trying to give them a hard time, but both Talbots showed a clean pair of heels to the rest of the field as they headed to Tertre Rouge and the Mulsanne Straight. But then, disaster! On the huge TV screens, we could see Gareth in GO52 slowing down as he approached the pits well ahead of the compulsory pitstop window. Mechanics ran over, bonnet was raised and there was feverish activity. Memories of a previous Le Mans where the throttle linkage came loose – and that’s what happened again, once more with a fix that allowed Gareth to get racing again after five minutes of lost time. So at the end of Race 1, Michael Birch was holding 1st place, with his nearest rival, a BMW 328, some 32 seconds behind. BGH21 had held station and was in 6th, Graham Goodwin had done a brilliant job bringing AYL2 home in 10th, and Gareth was by now over 3 minutes behind in 15th position. PL2 was running its own race, and Luc had moved up through the field to finish the first race in 46th position. “So, based on what we knew, Gareth had to take an average of fifteen seconds a lap for the remaining two races to catch Michael if he had any chance of winning, and that assumes no safety cars or red flags. One hazard we had overlooked was the very fast Bugatti, driven by Robert Spencer, with his fancy Red Bull lights. Gareth started the night race really well and found for the first three laps the Bugatti was with him with these superb lights. This presented us with another problem, as Michael was doing his best with normal Talbot lights! The lines are hard to find but he was losing time to Gareth and Robert Spencer. So quite simply, we changed the pit stop routine to get rid of Robert, and it worked as he slowed down when he didn’t have a tow. At end of the night race, Michael finished 4th, but was still in 1st place overall in JJ93, with Robert Spencer in the Bugatti 2nd with Gareth 3rd and BGH21 6th. It was close, and Gareth needed to find a minute to get 2nd place and virtually two minutes to Michael – possible, but only if nothing went wrong. 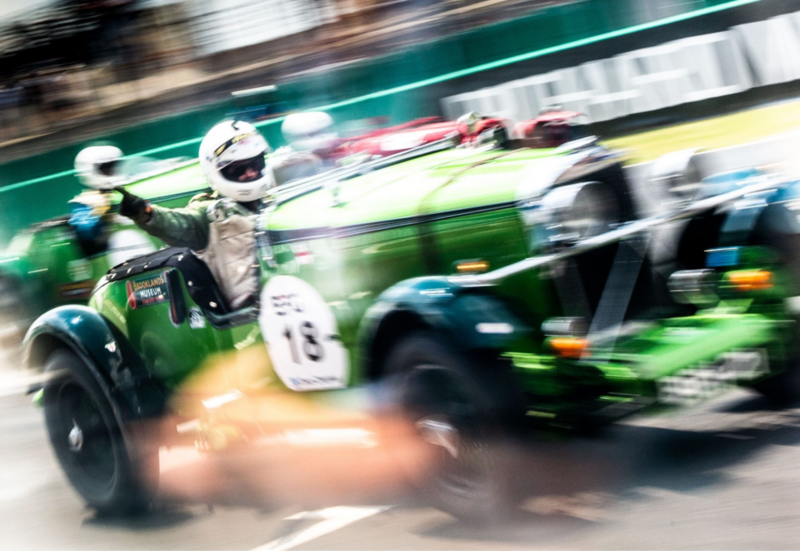 This was Talbot’s best performance at Le Mans Classic, and included Gareth setting a new pre-war lap record of 5:50.203, beating his own previous record by one second. It was this time last year that I commented on what, at the time, was the most exciting pre-war race I’d ever seen, at the Silverstone Classic when Gareth in GO52 just held off the Nash of Patrick Blakeney-Edwards to win the pre-war race. That race has now been demoted to second place!